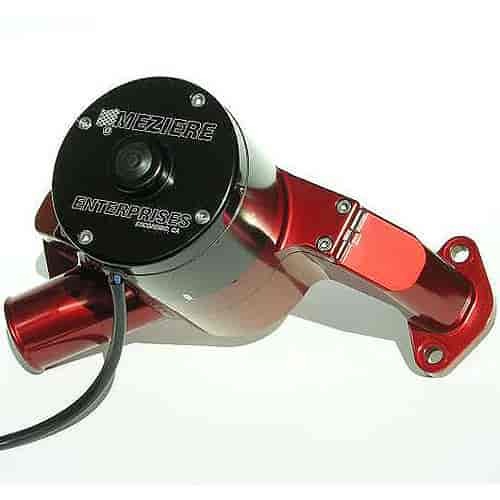 The Meziere 300 series high flow pump changed the rules about using electric water pumps on high horsepower street, nitrous, blown, or boosted engines. Delivering 55 gallons per minute of flow, the 300 series pump offers great cooling solutions to high horsepower vehicles. Higher flow rates reduce the chance of detonation. Light weight. Complete big block Chevy unit weighs only 7.4 pounds! Belt Drives: Standard BBC design will clear Jessel belt drives and comparable belt drive systems. Distributer Belt Drives: Spacers will be necessary to clear belt drive distributor systems. Finishing The System: This pump is supplied complete with gaskets and hardware. No additional items should be necessary for standard installations. Amperage draw: Under normal use the pump will draw 11-12 amps. Overall Height Dimension: The standard pump is 7.28'' long from the mounting surface to the tip of the pump. Pump Weight: This application weighs 7.4 lbs. Additional Notes: The standard 35 GPM pump is suitable for normally aspirated engines up to 650HP. Supercharged, turbocharged and high compression, high horsepower applications should use the 55GPM High Flow pump only. This model does not accept heater or bypass hoses as a standard. A single-ported version of this pump is available at no additional cost. Built to Flow 55 Gallons Per Minute! Mezieres aluminum 300 Series pumps are the highest flow electric water pumps on the market. Originally designed for NHRA Pro Stock cars, most people use these on street high performance cars. Although the appearance of these models are similar to the 100 series pumps, internally everything is larger. Inlet inside diameters are 1-3/8'' or 1-1/2''. The impeller and pump cavity allow for greater volume of water. The heavy duty motors provide increased torque and RPM. The resulting flow rate of 55 gallons per minute is enough to cool anything from 650+ HP street cars to circle trackers to a 2200 HP Pro Mod. We strongly recommend this series pump for supercharged, nitrous, turbo high performance street engines. The 300 series pump is also available in remote mount versions if needed. The pump housing, motor cap, and impeller are CNC-machined from 6061-T6 billet aluminum for superior corrosion resistance. The stainless steel impeller shaft runs through a 1-piece carbon-ceramic seal that isolates the epoxy-coated motor from coolant for years of reliable service. The motor has a radio frequency suppression circuit in the motor brush card to reduce ignition ''RF'' interference. Some pumps feature a welded inlet connection but most pumps are machined with a NPT port(s) to direct water into the pump using one of the inlet adapters that you choose to best suit your needs. Inlet adapters are available in slip-on rubber hose style to AN sizes, inlet fittings are sold separately and not included with pump. Most pumps and fittings are available in chrome, polished or anodized finishes. Extended inlets, extensions, and angle adapters are also available. Meziere pumps are American made with pride and quality far superior to any other performance aftermarket company. Don't be misled by ''Others'' inflated flow numbers and outlandish claims. Meziere says what they mean and mean what they say. The 2 year, unlimited mileage guarantee and full satisfaction money back guarantee should convince you that buying Meziere is buying value! Click on engine below to see your new Meziere 300 Series Electric Water Pump!